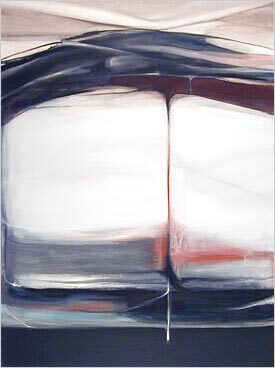 The paintings of Miguel Loredo are an invitation to explore the essence of light and the energy of the abstract. His paintings seem to exist in an intimate and secret world that longs for freedom and infinite space. His use of warm tones are slashed by piercing streaks of radiance that evoke a mysterious sense of purity. His drawings play with the precision of pencil marks and the abstract nature of ink. They are a poetic manifestation of gesture. They represent the contrasting forces of nature in an eloquent and elegant manner. There is comfort in the simplicity of lines and forms which seem to depict an undisturbed landscape. Loredo's work continues to evolve and take on a language all its own. A sense of conscious comfort seems to be the unifying element in his aesthetic outcome.